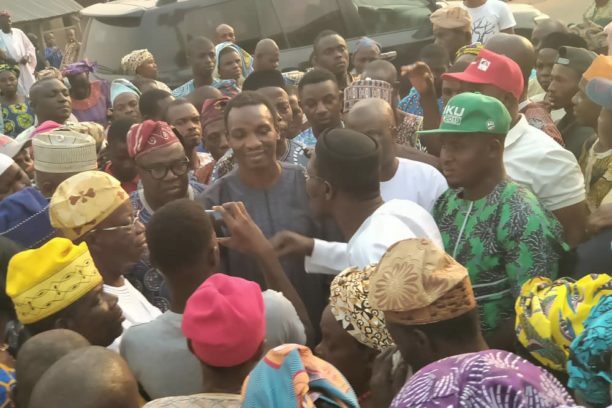 The governorship candidate of the Action Democratic Party (ADP), in the June 2018 gubernatorial election in Ekiti State, Otunba Segun Adewale has led thousands of his supporters back to the Peoples Democratic Party (PDP). Adewale who addressed a huge crowd of supporters at Ipoti, in Ijero Local Government on Sunday, told them that, it is time to return back home, “we must ensure that we deliver a resounding victory for the incoming President, Alhaji Atiku Abubakar and at this point, we must all come together to rescue Nigeria from perverted poverty ravaging the country. Adewale though, not a card carrying member of the ADP, but was adopted by the party after he tried to clinch the governorship ticket under his party PDP, according to a report, the former Governor, Dr Peter Ayodele Fayose made it clear to other contenders during the PDP governorship primaries not to waste their time and money for the ticket because of his anointed candidate, Prof Olusola Kolapo Eleka, which accounted for the reason he had to look for the ticket elsewhere to try his aspiration. Adewale whose supporters and followers cut across the 16 local governments in Ekiti State have been directed to return back to the PDP and prepare for the Presidential election and others elections. He was instrumental to the forming of the ADP structure in Ekiti, and with his announcement, it is expected that all the excos of the ADP in the 16 Local Government in the State has returned back to the PDP with their numerous members. In attendance were important political heavy weights including the former Chairman of Ijero Local Government, Hon. Joseph Ayeni, Central Senatorial Chairman, Hon. Tunji Kayode. Others were former House of Assembly member representing Ijero Constituency, Hon. Lai Oke and the former Chairman, Ijero Local Government, Hon. Bode Agbeleye. The event was witnessed by Ward Chairmen, party leaders and several party faithfuls. The returnees were received by the State Secretary of the party who represented the State chairman. Adewale in the midst of cheering announced his intention to be more regular in Ekiti. He also donated the sum of One Million Naira (N1,000,000) to assist the party in the build up to the Presidential elections coming up this weekend.